Work crews are set to close a portion of Guilford College Rd. this weekend so that pavement wedging work can be done as part of a lane-widening project near High Point Rd. 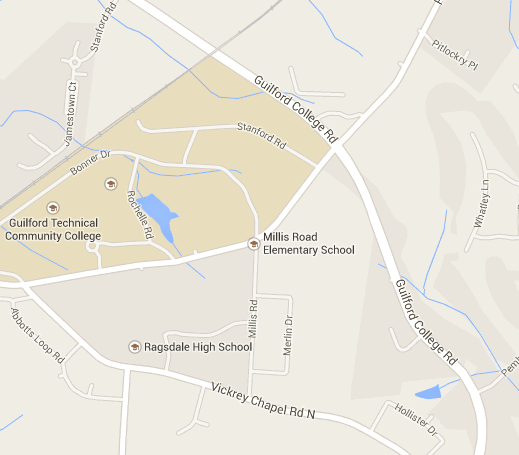 NCDOT will close Guilford College Rd. just south of High Point Rd. this morning. The road should be reopened by 6 pm Sunday, according to a press release. The work is part of a $40.1 million project begun in 2012 that will eventually see a four-mile section of High Point Rd. widened from two to four lanes. The new road will have a median and result in the construction of a new interchange with I-73. NCDOT will build the first diverging diamond interchange in the Greensboro area. You can see a video of a DDI at work here. The video, as above, shows a sample DDI from another area of North Carolina. Construction on this project should be complete by late 2015. This entry was tagged diverging diamond interchange, High Point Road, I-73. Bookmark the permalink.